VILLA VALHALLA UNIT #11 - extensive renovations have been made to both the building and our condominium unit. (Elevator, new stairways, exterior finish and in our unit we have redone the kitchen, living and dining room as well as installing a beautiful corner gas fireplace.) Our unit also has a dedicated private parking space located at the entrance to our unit. 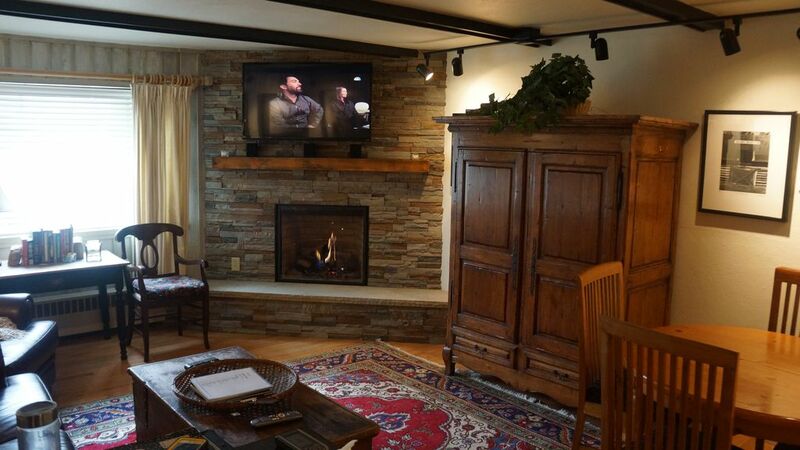 LOCATION - LOCATION - LOCATION...We are located in the center of Vail Village, less than 5 minutes walking to Gondola One! Also, the shuttle stop is just at the corner of the street should you want to head over to Lionshead or other areas in the Vail area. Our unit is just below the historic Christiania Hotel. They conveniently provide a front office for check-in, daily housekeeping, and concierge service during your stay in Vail. You will have a kitchen with essential items to cook your own meals - or it is an easy walk to multiple excellent restaurants in the core of Vail Village. The ground-floor unit also has a sleeping den with a set of bunk beds. The bunk beds are 75' long x 35" wide - slightly narrower than a standard twin bed (38-39" wide) but the same length. This is accessible through the unit as well as through an outside sliding door that leads directly to the swimming pool. The pool is heated to 100 degrees in the winter and 88 degrees in the summer. Your stay at the Villa Valhalla entitles you to utilize, without charge, the facilities at the Vail Vitality Center. This is located 2 blocks from our unit. Get your free pass at the front desk of the Christiania. Check out this excellent club that has a spa, weight lifting, exercise machines, a climbing wall, and hot tubs that overlook Gore Creek. Very few VRBO units provide all the amenities listed above - at a very reasonable price. This is the ideal vacation rental for a couple with two children. We wish you a wonderful visit to Vail. My wife and I were married in Vail. We have always loved the location! Best location in Vail - a short walk to Gondola One! Coin fed laundry room available on the first floor. Private space in front of the building. No stairs required to enter Villa #11. Free guest passes to the Vail Vitality center for the duration of your stay. Three televisions, one in the living room, master bedroom, and bunk area. Blu-ray system in living room. Gore creek and Roger Staub Park are across the drive from Villa #11. Great for dogs! Vail resort is at your fingertips from this location. A relaxed 5 minute walk to Gondola 1 from Villa #11. From the bunk room of Villa #11, a sliding door leads to the private heated pool area. In addition, guests are welcome to enjoy the Christiania's heated pool and excellent views of the mountain. The Villa Valhalla and The Galatyn Lodge share a private heated pool. In addition, guests are welcome to enjoy the Christiania's heated pool. Great location, 5 minute walk to gondola, perfect for our 2 adult, 2 kid family. Very comfortable beds, well equipped kitchen. Will hopefully return! We were there for a week in March for Spring Break - two adult, two kids (10 and 14). The location of the condo in Vail Village is perfect. It's right on the main street so we walked to dinner every night. It is literally an 8 minute walk (in ski boots!) to Golden Peak for ski school and even closer to Gondola One. The bunk room is definitely tight, but my kids liked it. The master bedroom and family area are nice sizes and comfortable. Kitchen had everything we needed. The washer/dryer is not inside the unit, it's for the building and is located in the hall outside the unit - bring quarters. The pool is very heated for winter - we swam after skiing every day. And the wonderful photos all around the condo are a nice personal touch. Great location, perfect amount of space for family of four. Loved being on the first floor. Pool was heated to 90 degrees - perfect for late summer swimming. Would love to stay here again! Nicely decorated, super clean, centrally located--a great place for the two of us. Great place for the two of us to spend a weekend without the kids. We enjoyed our stay at this very comfortable condo. It is close to everything. Close enough to walk to all of the restaurants and shops but far enough away from all of the hustle and bustle to be quiet and relaxing. Check in at the Christiana is easy and daily housekeeping and parking at the door are very nice. I would definitely recommend. All billing transactions and check-in and check-out is provided by the Christiania Hotel at Vail. Included in your stay is a free guest passes to the Vail Vitality Center and the use of the Christiania and the Villa Valhalla heated pools.